In 1982, Karen Olson was a marketing executive who developed promotional campaigns for consumer products. One morning, on her way to a meeting, she saw a homeless woman, someone she’d seen over and over again on her way to work. She decided to buy a sandwich for the woman. The stranger accepted the sandwich but asked for something else—a moment to be heard, to be comforted, and to be considered as more than a mere statistic on a cold street corner. Soon, Karen and her two young sons began frequent trips to New York to hand out sandwiches to the homeless. As she came to know some of the city’s homeless people, she began to understand the profound loss and disconnection that homelessness causes. That understanding turned into an enduring commitment. Olson learned that there were hundreds of homeless people, including families, in her home community of Union County, New Jersey. She turned to the religious community for help, convinced that there were many who shared her concern and that together they could do what they couldn’t do alone. Within ten months, eleven area congregations came forward to provide hospitality space within their buildings. The local YMCA agreed to provide showers and a day center for families. A car dealer discounted a van. On October 27, 1986, the first Interfaith Hospitality Network opened its doors. As word spread, ten more congregations formed a second Network. Programs for transitional housing, childcare, and family mentoring followed—outgrowths of increased awareness and involvement. The success of the first Networks led other congregations to seek help in developing similar programs. In 1988, National Interfaith Hospitality Network was formed to bring the program to other areas where neighbors could work together to help homeless families. To date, Family Promise has established 149 affiliates in 39 states, using the services of more than 125,000 volunteers and 5,000 congregations. The IHNs provide shelter, meals, and housing and job placement support to more than 45,000 homeless family members annually, 60 percent of them children. Witnessing firsthand the obstacles that low-income families face, Family Promise leaders and volunteers have been motivated to do more. Affiliates have seized the initiative to create additional community programs, such as housing renovation, job training, and healthcare programs. As a way of helping at-risk families avoid homelessness, Family Promise began training volunteers to advise and mentor families, helping them achieve and maintain self-sufficiency. To foster a greater understanding of the root causes of homelessness, Family Promise launched the Just Neighbors educational curriculum. In 2003, the organization changed its name to Family Promise to reflect a broader range of programs and reaffirm its core commitment to helping families realize their own potential. And although 40 states and 125,000 volunteers now define the breadth and depth of the organization, Karen’s mandate remains in place…if you can strengthen one family you can strengthen a nation. 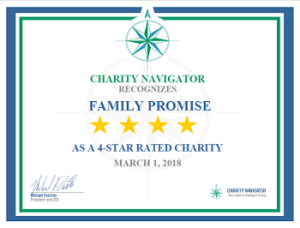 As a national organization, Family Promise has been awarded a 4-star Charity Navigator designation for the 5th year in a row. Only 9% of nonprofits achieve this, and it reflects our commitment to transparency, good governance, fiscal prudence, and strategic growth. You can read more about the accomplishment or our National and Affiliates’ commitment to excellence here.